This project monitors the voltage of a battery and displays a 5-element bar-graph indicating battery charge state. A MOSFET can be added if desired cut off supply at low voltage, to protect the battery from over-discharge. It is particularly applicable for multi-cell Lithium-ion Polymer (LiPo) packs, which are easily ruined if over-discharged. 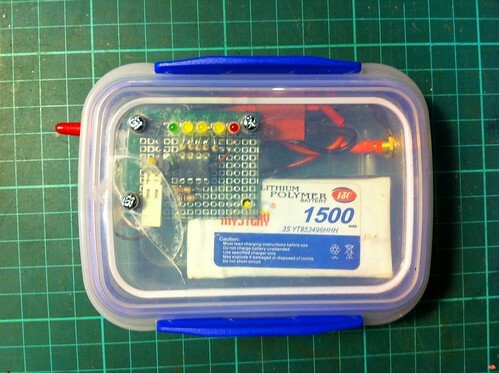 It is intended for use in high power applications such as portable lighting, robotics and power tools where a charged SLA or LiPo battery is discharged in the presence of a human operator. The first deployment was for a high-power bicycle headlamp. Design was inspired by the simple state-of-charge indicators present on some electric bicycles. The advantage over existing inexpensive "off the shelf" protection circuits is that this circuit gives a visual indication of state-of-charge, presented as an easy-to-read bar-graph. Existing protection circuits (often designed for flashlights or model aircraft) either have no display (sudden surprise cutoff), digital voltage display (requires memorizing cutoff voltages) or audio-only alert (no visual display). 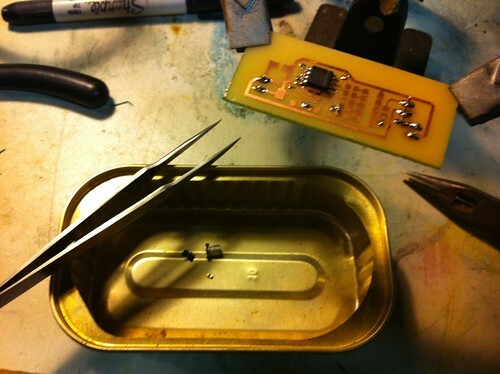 An Atmel ATTiny45 microcontroller is used to sample the battery voltage and control the LED bargraph. Power for the microcontroller is derived from a 78L05 regulator connected to the main battery. Battery voltage is monitored using an analog input via a voltage divider and compared to the microcontroller's 1.1v internal voltage reference. The bargraph will show 4 LEDs when at "full charge" and 1 LED when at minimum usable voltage. When voltage is critical a 5th "alert" LED will illuminate (and output supply can be terminated). The circuit can be used purely as a voltage indicator by leaving off the optional MOSFET switch components. If a MOSFET is fitted this can be used to disconnect the main load when the battery is depleted. The bargraph consists of 5 3mm LEDs (green, yellow and red) arranged GYYYR. The first four (GYYY) form the bargraph and the 5th (red) is the critical alert. The first three are connected to dedicated output pins, the final two share a single pin in a totem-pole arrangement. The fourth LED shares state with the output FET (if fitted), when this LED is lit, power is good and the FET is enabled. When this output pin is cleared, the fifth LED (the complementary red CRITICAL alert) is illuminated and the FET is disabled. As the monitor circuit is indended for use in high-drain situations (0.5--10A), the approx 20mA consumed by the monitoring circuit is considered negligible. In particular the voltage divider is not isolated from supply between samples, so presents a constant drain of around 850uA. Current through the bargraph elements is limited by a 1kΩ resistor to around 3mA per element, so the bargraph consumes up to 12mA when at FULL level. Software is configurable for the type and number of cells. 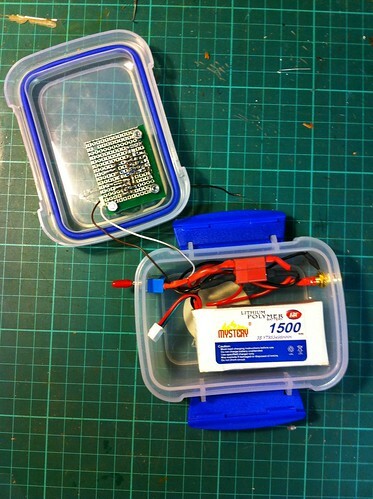 The initial application of a 3-cell (11.4v nominal) Lithium-ion Polymer (LiPo) battery will be used to describe the code. The code converts these thresholds to analog sample values at compile time, defining corresponding VL_FULL..CRIT constants. do nothing, go straight to sleep mode until timer interrupt. Since samples are accumulated at 4Hz, and each 4 samples are averaged, the outputs will be changed only once per second. Averaging is used to avoid falsely detecting a CRITICAL state when transient spikes such as motor start occur. 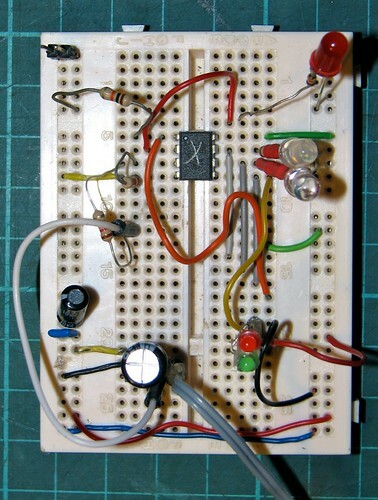 The circuit was prototyped on a solderless breadboard, with battery simulated using a 24v supply and an adjustable-output regulator (LM317T). 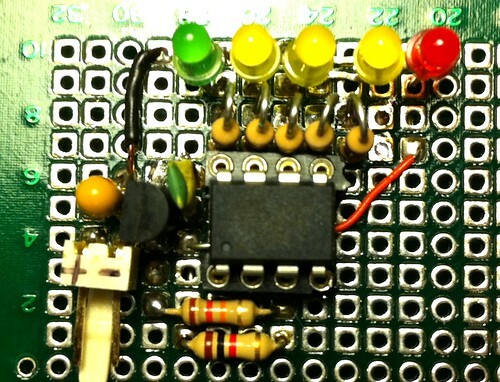 A selection of LEDs with one leg replaced by a current-limiting resistor have been made to simplify use of LEDs in breadboard prototypes. For in-circuit programming I use the tuxgraphics AVRUSB500v2, as this programmer features a 5-pin SIL programming header, which is very convenient for breadboards. Once the design was proven, a version was constructed on through-hole prototyping board with components arranged to take advantage of pin-bridging where possible. This turned out to be difficult since the chosen double-sided prototype board featured a solder mask that was VERY resistant to bridging (this would normally be a laudable feature). A plain copper single-sided protoboard would have actually been a better choice. 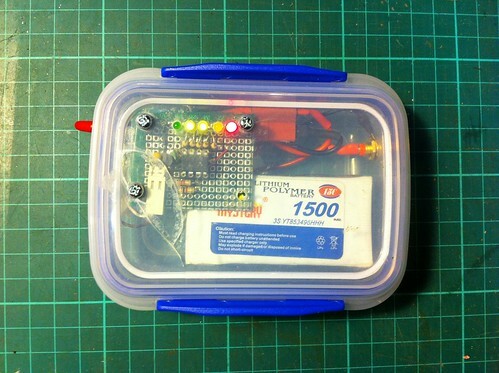 The prototype has been deployed for use as a bicycle headlamp battery pack. 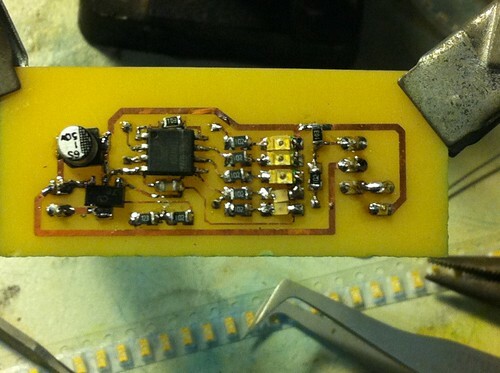 Subsequent revisions will use ATTiny25 in SMD package, and SMD components. Thanks to Warranty Voider for the breakout board design.